Looking to sell your gold for a fair price? Pawn Brokers Exchange is here to help! Our representatives specialize in gold appraisals to offer you the most competitive rates. You can be sure you are receiving the fairest deal in Salt Lake City. Let Pawn Brokers Exchange buy your gold so you can receive the cash you need right away. At Pawn Brokers Exchange, we are highly experienced in the assessment and appraisal of all gold jewelry that comes into our shop. Our staff is trained to carefully and accurately appraise your gold pieces and explain what we will pay and why. We will help you understand the process completely so you can be sure you are getting a fair deal for your gold. Best of all, we will pay you the cash you need when you need it most. 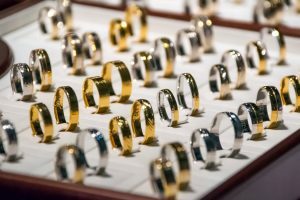 Pawn Brokers Exchange is Salt Lake City’s top choice for gold services. Our brokers deal in a variety of gold pieces- whether your gold jewelry is intact or broken, we can help. We also buy, sell and loan gold buillion and coins in addition to jewelry. If you are in the market for gold jewelry, stop by Pawn Brokers Exchange. Come see our dazzling array of fine gold necklaces, rings, bracelets and earrings for the special someone in your life. When it comes to gold, we do it all at Pawn Brokers Exchange! We are conveniently located in Salt Lake City and pride ourselves on excellent, fair customer service. Our clients are treated with the utmost courtesy and respect in addition to receiving the fairest prices for their gold. When you sell with Pawn Brokers Exchange, you can be certain you are receiving the cash you deserve for your valuable items. Why go anywhere else in Salt Lake City when selling your gold jewelry, buillion or coins? Pawn Brokers Exchange looks forward to working with you and appraising your gold items. Call today to schedule an appraisal appointment with one of our highly-experienced staff members- 801-238-0111. When you need cash fast for your gold but want to receive a fair price, Pawn Brokers Exchange is your Salt Lake City choice.